We here in Archives & Special Collections are ready for whatever Mother Nature throws at us in the next couple of days! We’ll dig ourselves out of the snow just like these railroad workers from 1914. 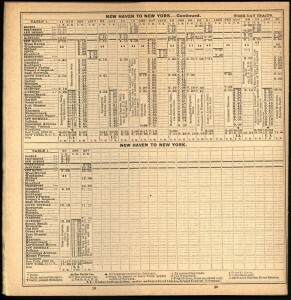 Are trains faster today than they were 100 years ago? If someone took the “Banker’s Express” from New Haven at 8:00a.m. he (and in that day and age it was always a “he”) would get to New York City at 9:44a.m. How does that compare to today? The “Hookset,” built in 1842 at the Hinkley & Drury Shops for the Concord Railroad. 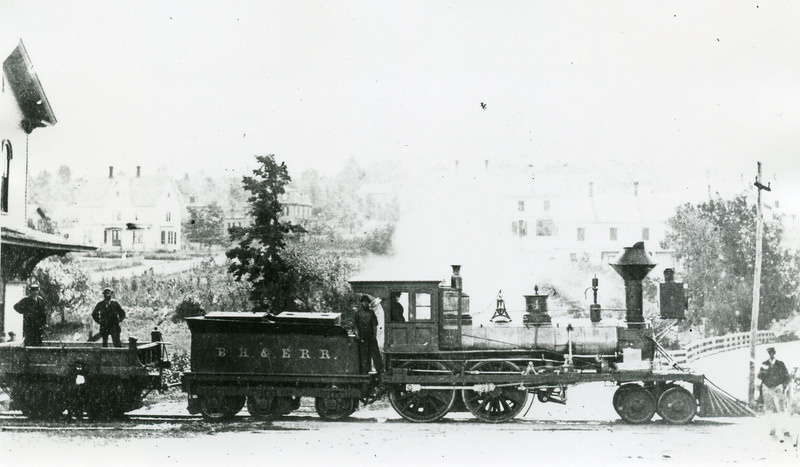 Was Locomotive #1 of the Boston, Hartford & Erie Railroad in 1863, then the New York & New England Railroad’s Locomotive #1 in 1871. 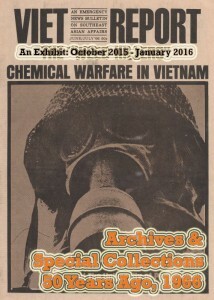 From the Frances D. Donovan Papers, Archives & Special Collections, University of Connecticut Libraries. 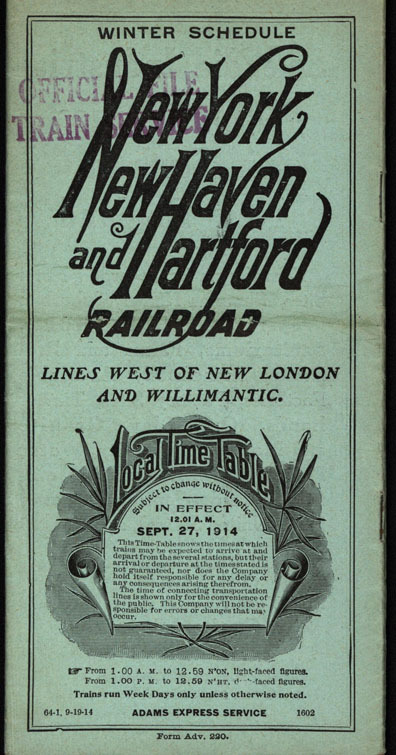 One hundred and fifty years ago, in June 1863, the Boston, Hartford & Erie Railroad was incorporated with the goal of forming a gateway to western markets for New England goods and of bringing coal from Pennsylvania into New England by way of Newburgh, New York, to Waterbury, Connecticut, and beyond. 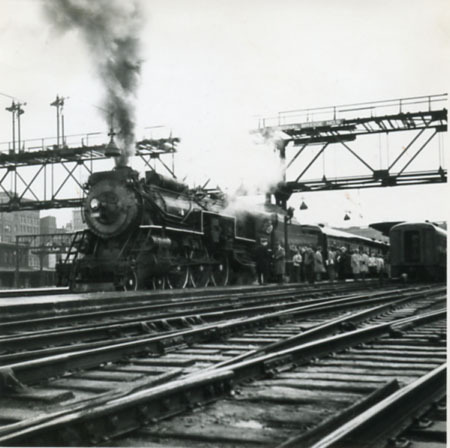 Its lofty goal disintegrated when it came under the control of “as ribald a bunch of crooks as railroad history has ever produced,” wrote D.W. McLaughlin in his article “Poughkeepsie Gateway,” for the October 1968 issue of the Bulletin of the Railway & Locomotive Historical Society. The railroad ran into a myriad of troubles, including the realization that building an east-west route across Connecticut would involve navigating the state’s ridge lines, the problem of aligning with the non-standard gauge of track on the Erie Railroad (the western line it would hook up with once the railroad cars crossed the Hudson River), and the lack of a bridge for which to travel over the river. That apparently did not stop the railroad’s promoters from selling stock in the line, which they proceeded to mercilessly raid and pillage. The legislature of the state of Massachusetts was persuaded to give $3,000,000 in grants, odd in that the bulk of the railroad didn’t actually travel in that state, as it went into Connecticut. 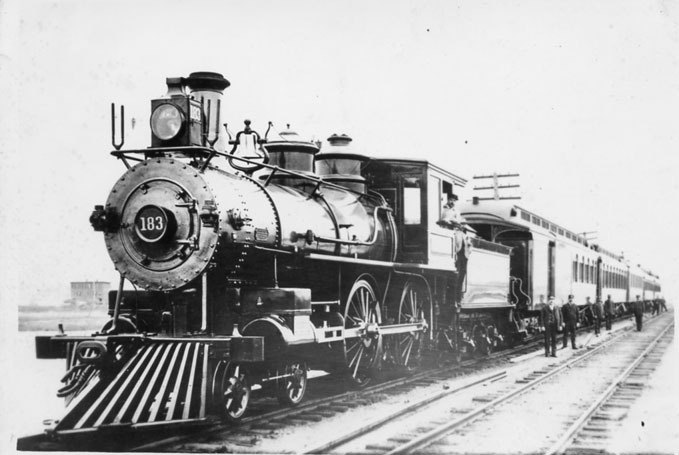 By the time the graft caught up with all the players, in 1870, the railroad was in bankruptcy with a mere $10.00 left in its accounts, Massachusetts was out all of the money it invested, and very little actual railroad track was ever laid. 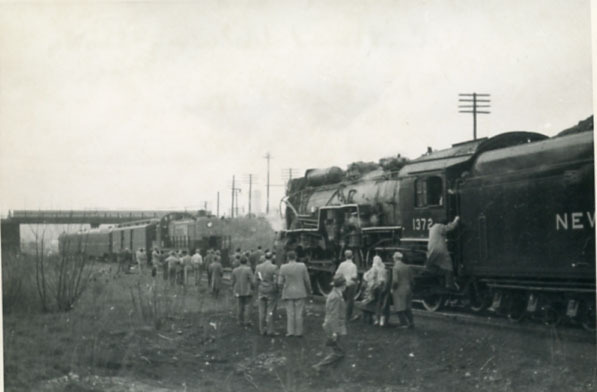 The remaining assets were transferred to the receivers of the New York & New England Railroad, who rerouted the railroad line from New York City to Boston and eventually became part of the New Haven Railroad system. The New England Limited, better known as the White Train, or Ghost Train, which traveled from New York to Boston on the Air Line Division (formerly the Boston & New York Air Line Railroad) of the New York, New Haven & Hartford Railroad in the early 1890s. Leroy Roberts Railroad Collection, Archives & Special Collections, University of Connecticut Libraries. Let’s get on board to celebrate National Train Day on Saturday, May 11! Amtrak organizes this event to celebrate the ways trains connect us all and to learn how trains are an instrumental part of our American story. 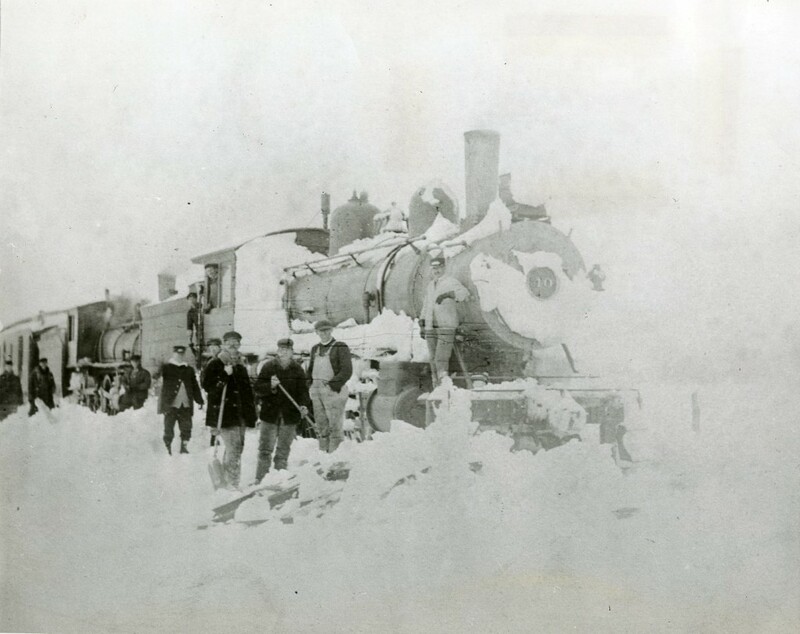 We here in the Railroad History Archive in Archives & Special Collections are celebrating this day by enjoying the rich resources in the collection that document how the railroad was pivotal to the lives of the people of New England in the Golden Age of Railroads in the late 1800s. 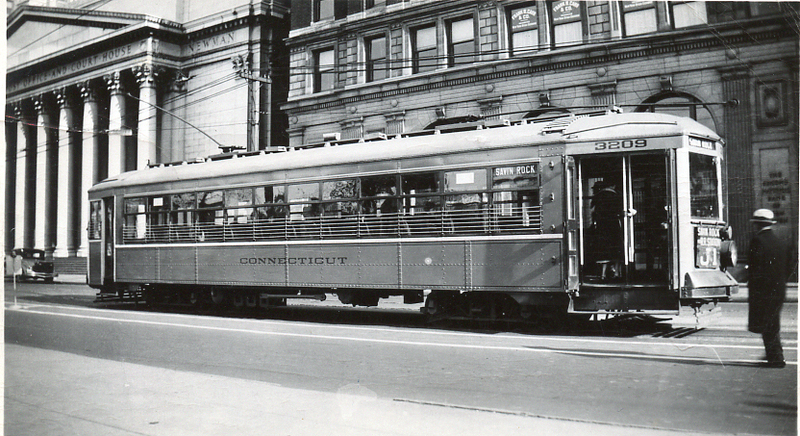 This photograph shows the New England Limited on the Air Line Division, formerly the Boston & New York Air Line, which was built to provide a direct route diagonally across the state of Connecticut to connect the important financial centers of New York City and Boston. At the time this photograph was taken, in the 1890s, the B&NYAL was taken over by the New York, New Haven & Hartford Railroad and then known as the Air Line Division. The New England Limited reminds us of a time when luxurious trains were ridden by the Gilded Era’s captains of industry. 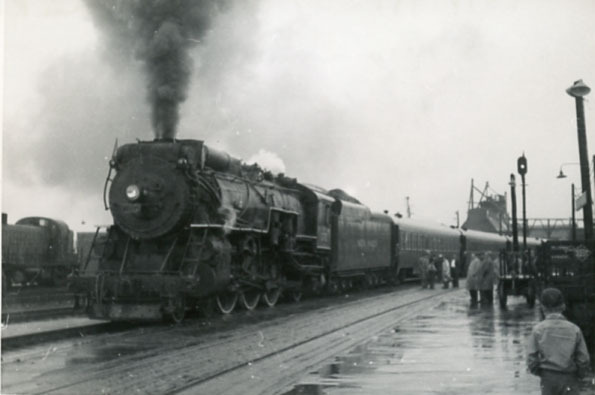 New Haven Railroad's last steam trip, April 27, 1952, at New London, Connecticut. Photograph by Seth P. Holcombe, Seth B. Holcombe Papers, Archives & Special Collections of the University of Connecticut Libraries. 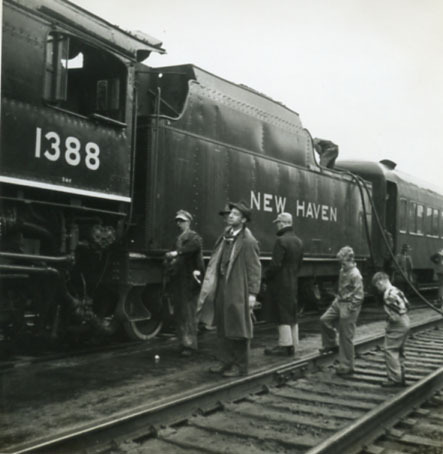 New Haven Railroad's last steam trip, April 27, 1952, "Engineer Kinney" (location unidentified). Photograph by Seth P. Holcombe, Seth B. Holcombe Papers, Archives & Special Collections of the University of Connecticut Libraries. 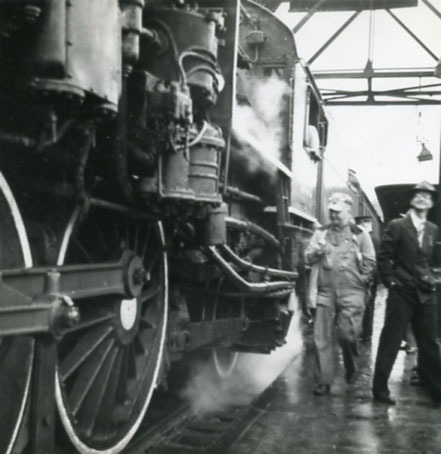 New Haven Railroad's last steam trip, April 27, 1952, "Road foreman Robay looks at 1388" at South Station in Boston, Massachusetts. Photograph by Seth P. Holcombe, Seth B. Holcombe Papers, Archives & Special Collections of the University of Connecticut Libraries. 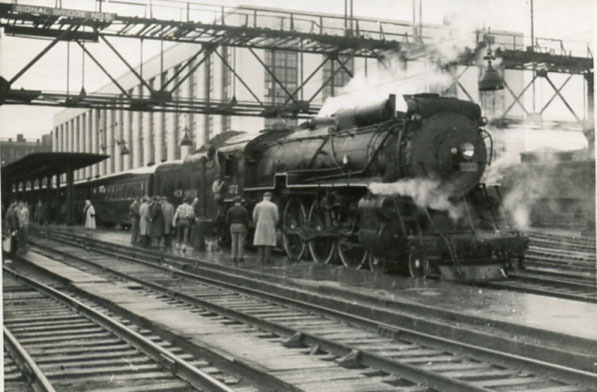 New Haven Railroad's last steam trip, April 27, 1952, at South Station in Boston, Massachusetts. 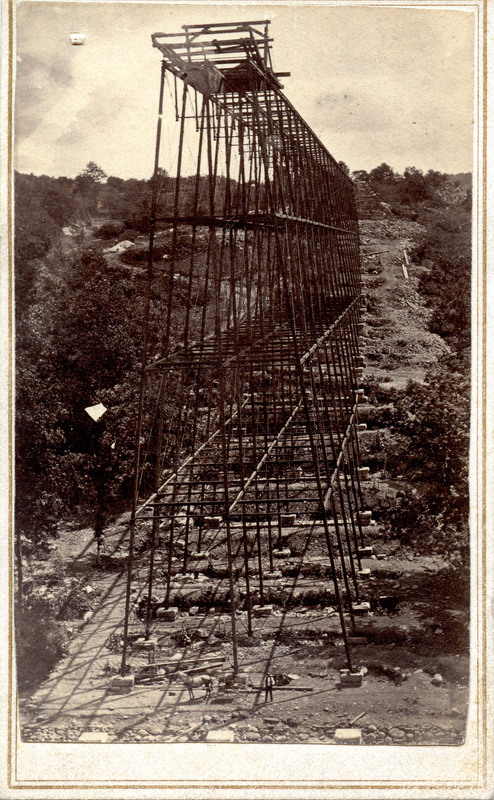 Photograph by Seth P. Holcombe, Seth B. Holcombe Papers, Archives & Special Collections of the University of Connecticut Libraries. 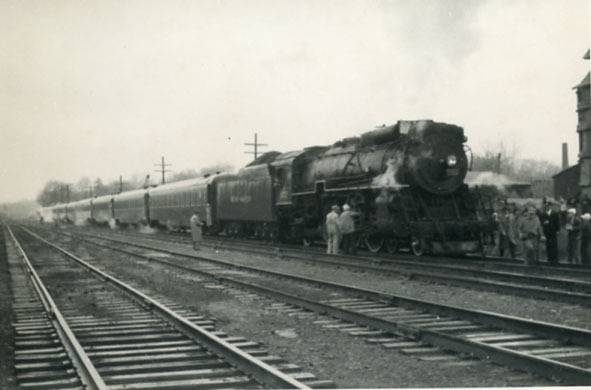 New Haven Railroad's last steam trip, April 27, 1952, at Willimantic, Connecticut "after getting water". Photograph by Seth P. Holcombe, Seth B. Holcombe Papers, Archives & Special Collections of the University of Connecticut Libraries. 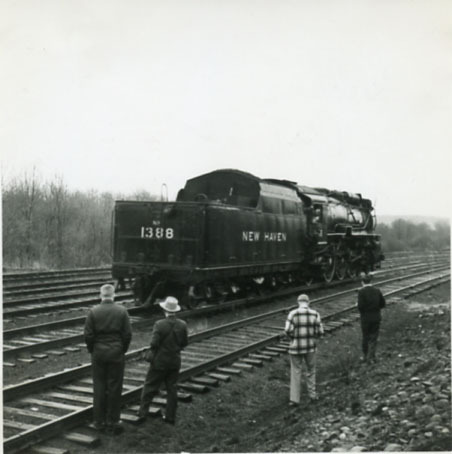 New Haven Railroad's last steam trip, April 27, 1952, at New London, Connecticut "looking rear from tender". Photograph by Seth P. Holcombe, Seth B. Holcombe Papers, Archives & Special Collections of the University of Connecticut Libraries. In the early 1950s the New Haven Railroad phased out use of its steam fleet in favor of its electric and diesel locomotives. 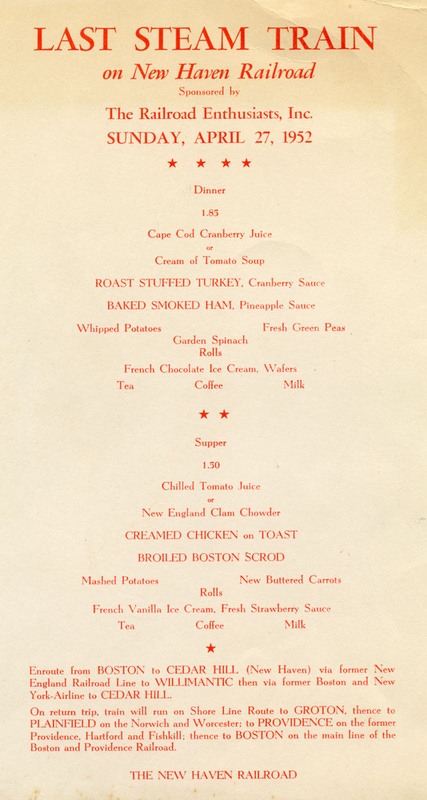 Shown here is a menu and photographs taken on an excursion trip from Boston’s South Station to New Haven, Connecticut, through the route of the old New York & New England Railroad with stops in Willimantic and New London, Connecticut. The photographs were taken by Seth P. Holcombe and Ralph E. Wadleigh, both of whose photographs we hold in the Railroad History Archive. Menu for New Haven Railroad’s last steam trip, April 27, 1952. Donated by Frank Morrissey, University Railroad Collection, Archives & Special Collections of the University of Connecticut Libraries. William B. 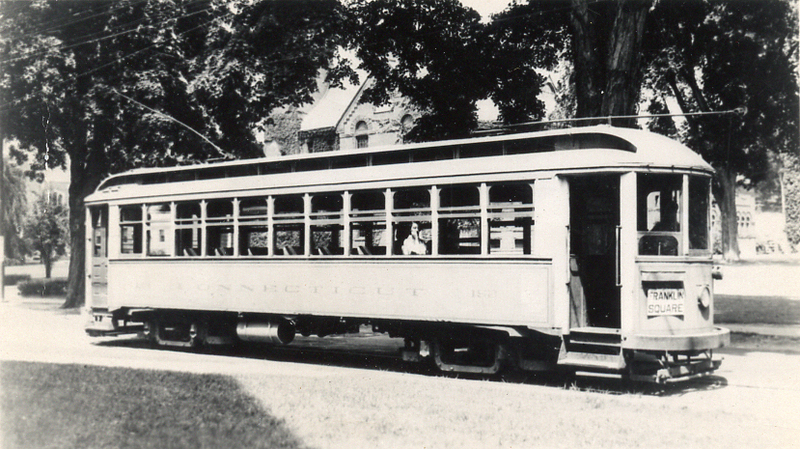 Young was an avid fan, enthusiast and historian of the Connecticut Company, particularly its trolley cars, which controlled the street railroad system that provided public transportation in the state’s towns and cities from 1905 to 1948. Mr. Young, born in 1942, spent much of his youth in Stamford and Roxbury, Connecticut, where he explored local trolley right-of-ways, collected railroad documents and memorabilia, took photographs, and rode the trains at every opportunity, not just in the state but across the country. While earning a degree in history (focusing many of his term papers on transportation history) at Yale University he worked summers as a Conductor on the Chicago Transit Authority. After he graduated in 1966 he was commissioned as an Ensign in the U.S. Navy, serving as a Naval Aviator during the Vietnam War, and continued as a flight instructor after the war, when he left active duty in 1977. After his service he became a database programmer and lived in North Carolina until his death in December 2010. 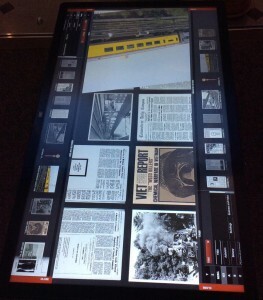 Mr. Young compiled an enormous and extraordinarily comprehensive collection of materials about the trolley system which includes publications, photographs, timetables, maps, postcards, manuals, and reports. He corresponded with an extensive network of other knowledgeable railroad and trolley historians, where the minutiae of the cars and the broad history of the company were discussed and dissected with equal interest and regard. His ultimate goal in amassing this information was the creation of a car roster database, which classified each car in the system by number, owner, purchase cost, weight, roof, type, builder, first year in service, accident history, motor type, compressor type, and controller. 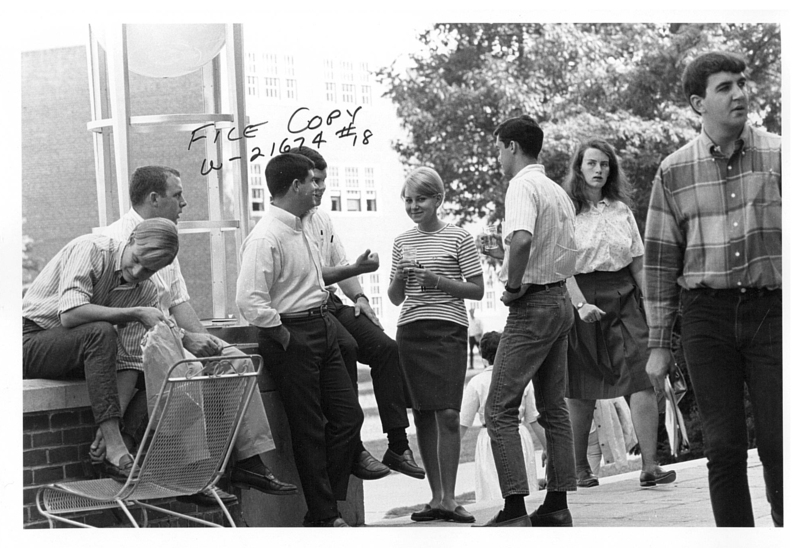 In February 2011 Mr. Young’s sister, Mary Young, contacted the archives about donating the collection. In the time between this initial contact and its ultimate donation in June 2012, Ms. Young and her sister Lucy gathered the materials from Mr. Young’s home in North Carolina, separated those materials most appropriate for donation, boxed and organized the materials by format, created “finding guides” and other descriptions to ease discovery of the materials, and provided much of the written information about Mr. Young and the company that helped place it all in context. This comprehensive collection is now available for use by the general public, and its finding aid, which includes long descriptions of the life of Mr. Young and the Connecticut Company, is available at http://doddcenter.uconn.edu/asc/findaids/wbyoung/MSS20120077.html. 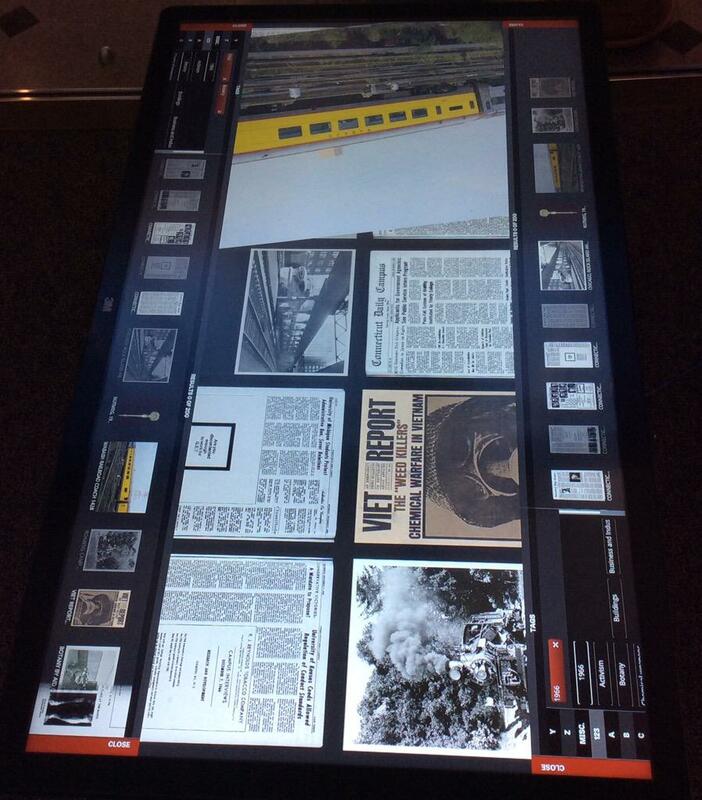 An electronic version of the database will be made available by the Shore Line Trolley Museum, but an extensive printout of the database can be found with the collection here in Archives & Special Collections. 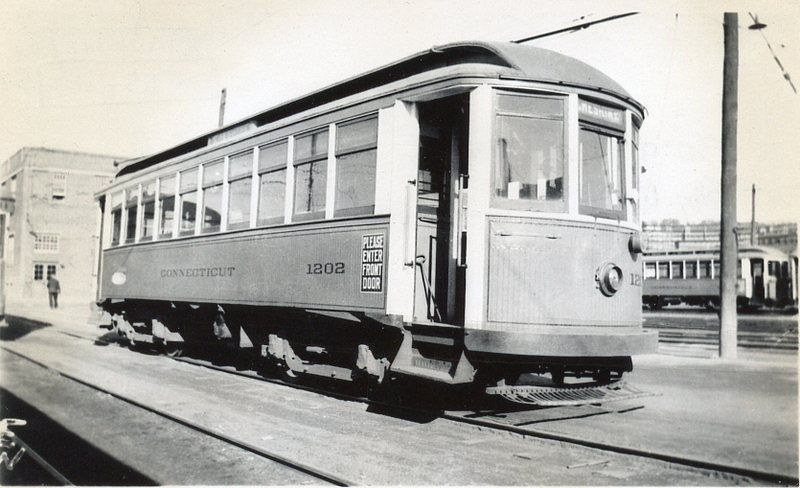 The Connecticut Company, which by 1907 was controlled by the New York, New Haven & Hartford Railroad, operated most of the trolleys and buses in Connecticut, with fourteen divisions and, at its peak in the 1910s, a roster of over 2200 cars and nearly 800 miles of track that either ran in or connected twelve major Connecticut cities. 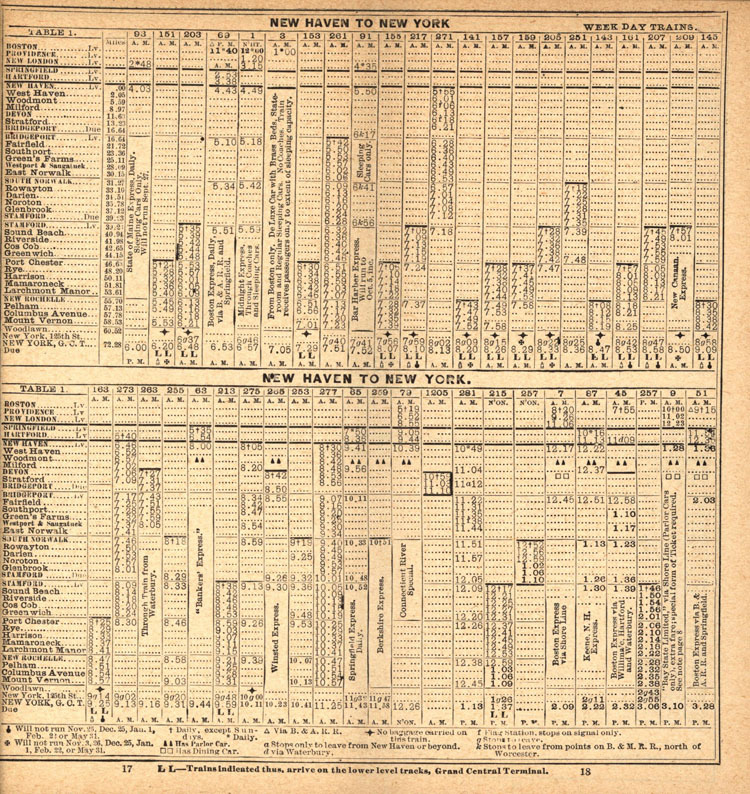 Ridership started to drop in the 1920s and systems were abandoned by the 1930s. 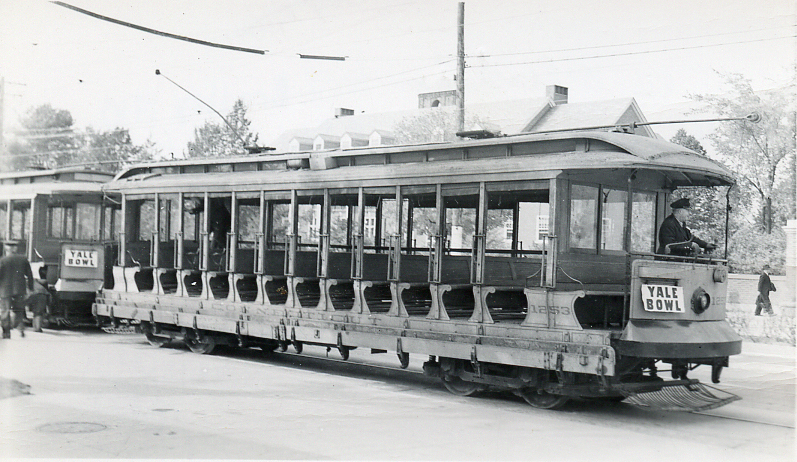 The last trolley ran on September 25, 1948, in New Haven, as the post-war boom of personal ownership of the automobile became widespread. Connecticut is lucky to have two trolley museums to preserve this important aspect of transportation, including the Shore Line Trolley Museum in East Haven (http://www.shorelinetrolley.com/) and the Connecticut Trolley Museum in East Windsor (http://www.ct-trolley.org/). 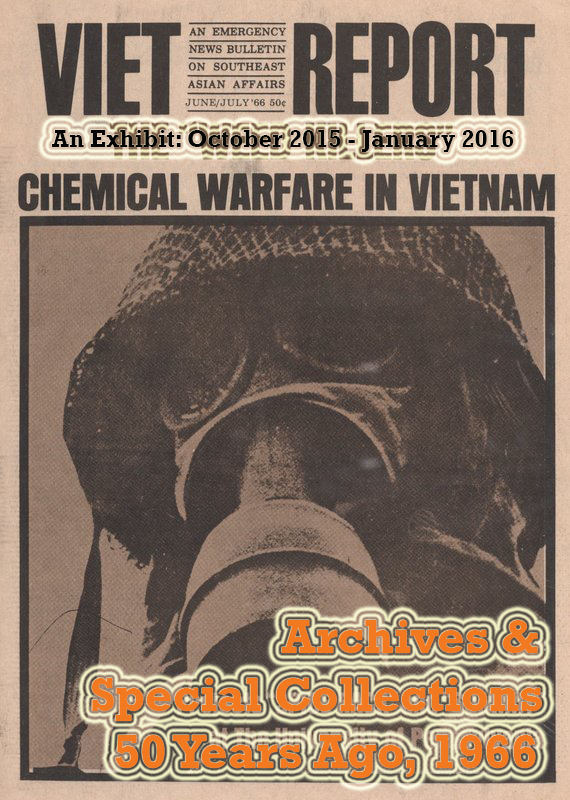 The archive is deeply grateful to the family of William B. Young for this valuable collection that will serve as a vital resource for this corner of the state’s transportation history. 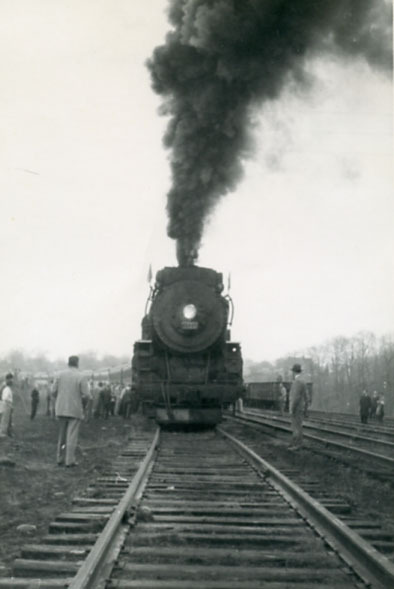 Connecticut Railroad Commissioner reports now online! 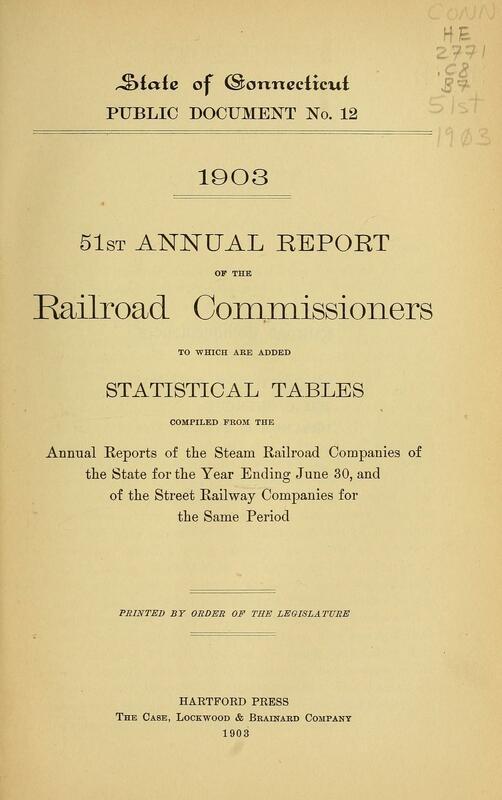 In our continuing efforts to make our collections available online we present to you a set of Railroad Commissioner Reports of the State of Connecticut, now available through the HathiTrust at http://archive.org/search.php?query=%22uconn%20libraries%22%20%20railroad%20%22annual%20report%22. This is done courtesy of our cooperative relationship with the Boston Libraries Consortium and the Digital Programs and Preservation and Conservation staff here at the UConn Libraries. 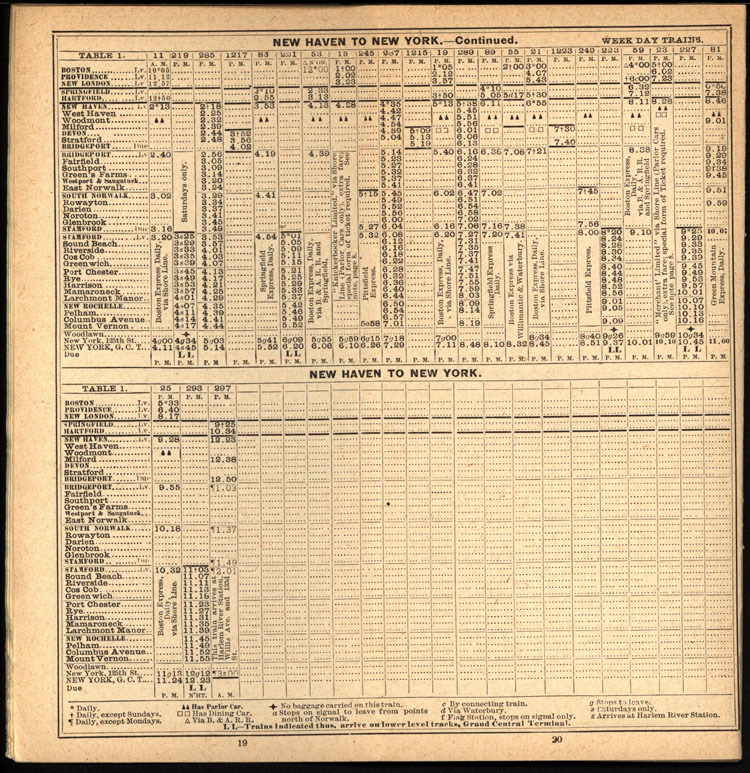 The railroad commissioner reports are very rich documents, published yearly between the 1850s until 1911, and provide details about bridges, structures and track laid for each railroad in the state as well as the expenditures and income. Many of the issues have details about train accidents and lists of the members of their board of directors, important information for any railroad researcher. Many of these reports were donated by a long-time donor of railroad materials, Mr. Leroy Beaujon of Roseville, California. Mr. Beaujon has a soft spot in his heart for the Central New England Railway, which ran in western Connecticut and eastern New York State until it was taken over by the New Haven Railroad in the early 1900s. He grew up on Canaan, Connecticut, so his interest in the railroads of that area was formed early in his youth and has remained throughout his life. We are pleased that we can make Mr. Beaujon’s gift of the railroad reports available not only to the researchers who visit us here at Archives & Special Collections but to anyone, anytime and anywhere. Check out the reports online, and enjoy! 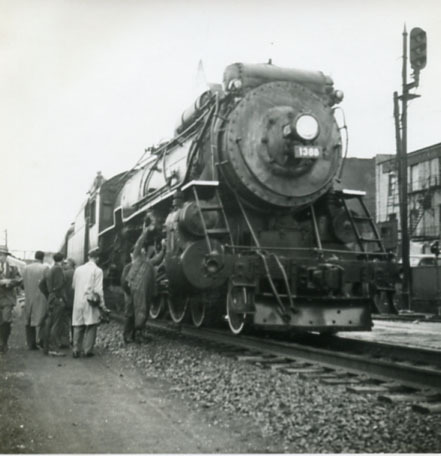 “The 12:25 to Waterbury.” Engine 1338 of the New Haven Railroad in Newington, Connecticut, on July 10, 1946. Photograph by Seth P. Holcombe. Seth P. Holcombe loved steam trains, and as a youth who grew up near the railroad station in Hartford, Connecticut, he particularly admired those of the New York, New Haven & Hartford Railroad (better known as the New Haven Railroad), the predominant railroad in southern New England from 1872 to 1969. Mr. Holcombe was born in 1918 and lived his life in the Hartford area, graduating from Trinity College in 1941 and serving as registrar of the Morgan Horse Club (now known as the Connecticut Morgan Horse Association) as an adult. He was also an avid photographer and took numerous photographs of the trains he loved. 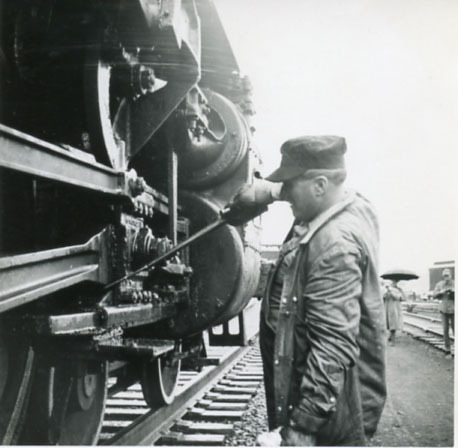 His interest never wavered from the steam trains of the New Haven Railroad, so when the railroad switched to a diesel fleet in 1952 Mr. Holcombe’s interest in the railroad waned. Seth Holcombe died in 2009 and his wife Lucy made a gracious gift of his photographs to the Railroad History Archive this year. 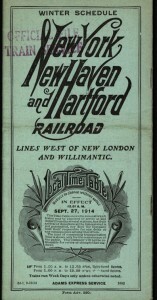 The collection shows trains in and around Hartford, as well as other railroad lines across New England when Mr. Holcombe would travel on excursions. 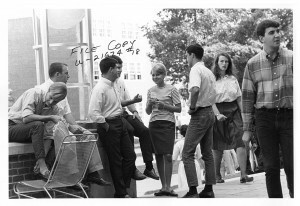 A finding aid to the collection is available at http://doddcenter.uconn.edu/asc/findaids/holcombe/MSS20120040.html and all are welcome to come to Archives & Special Collections to view this terrific set of photographs. 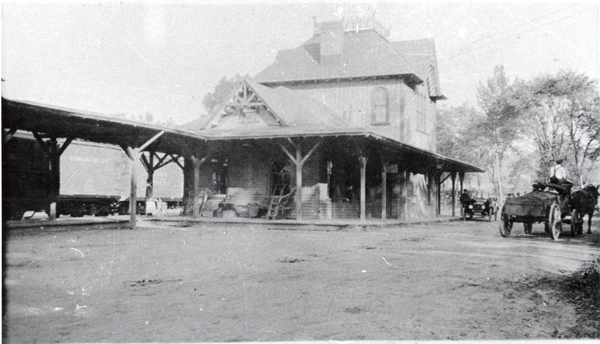 Torrington, Connecticut, railroad station, ca. 1900, a photo by Archives at the Thomas J. Dodd Research Center on Flickr. 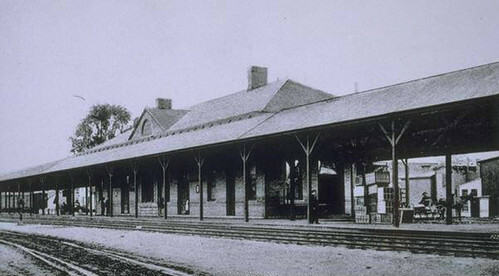 The Torrington, Connecticut, railroad station was built in 1898, as a stop on the New York, New Haven & Hartford Railroad (better known as the New Haven Railroad). The line was originally built as the Naugatuck Railroad, which traveled from Devon north to Winsted, beginning in 1849. 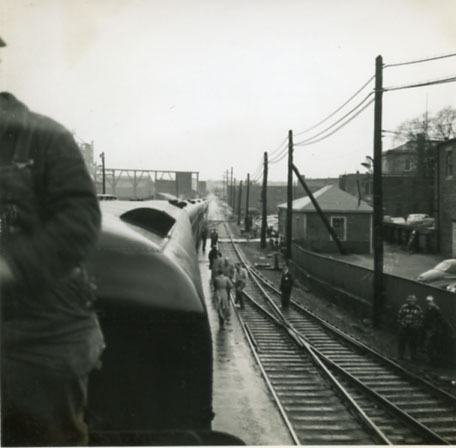 We’ve placed ten photographs of the Torrington station from the Railroad History Collections on to Flickr — check them out at our photostream, beginning at http://www.flickr.com/photos/doddcenter/tags/torrington/. Let us know what you think of them! On Wednesday, October 26, at 7:00p.m. I will be giving a talk at the Oliver Wolcott Library in Litchfield, Connecticut, about that town’s railroad history. The story starts with the Shepaug Valley Railroad, which opened for business on January 1, 1872, and traveled from Hawleyville to Litchfield in this mountainous region of western Connecticut. 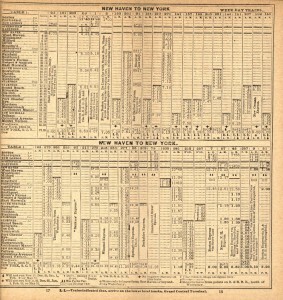 After financial difficulties in the 1870s and 1880s forced the railroad to restructure, the line emerged in 1887 as the Shepaug, Litchfield and Northern Railroad, only to come under the control of the massive New York, New Haven & Hartford Railroad, better known as the New Haven Railroad, in 1892. 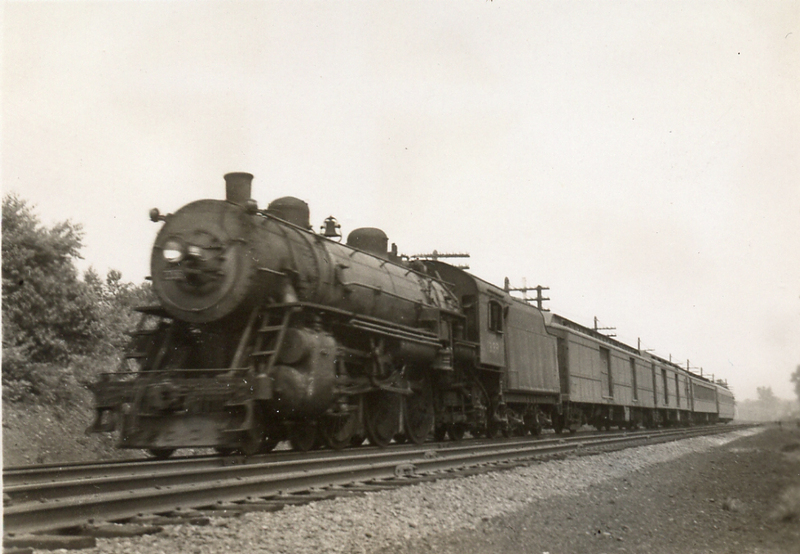 From that time to its final demise in 1948 it was known as the Shepaug Branch of the New Haven Railroad. As the Shepaug, Litchfield and Northern Railroad it was nicknamed the “slow, late and noisy.” The route contained almost 200 curves, one tunnel, and several stiff grades. It was known as the “second most crooked railroad in the U.S.” (the most crooked was the Mount Tamalpais and Muir Woods Railway in Marin County, California), measuring 32 miles of track but was actually 17 miles as the crow flies. Train speed could never exceed 20 miles per hour. If you are interested in attending the talk at the Oliver Wolcott Library you can register at http://www.owlibrary.org/programs.php.